While Comic-Con International’s WonderCon in Anaheim, Calif., attracted an estimated 40,000 pop culture fans this past weekend, Asbury Park Comic Con on Saturday offered similar attractions on a smaller scale for East Coast fans. Kendall Whitehouse, Knowledge@Wharton’s technology and media editor, covers trends in entertainment and pop culture. He stopped by the Asbury Park, N.J., expo and filed this report. While still modest in size, Asbury Park Comic Con (or, as it sometimes appears, “Comicon”) has grown substantially during its three-year history. After two years in a local bowling alley with a maximum capacity of 300, this year’s event moved to the larger Asbury Park Convention Hall with panel sessions held across the street at the Wonder Bar. Robert Bruce, co-founder of the Asbury Park expo, reported selling 1,400 advance tickets with an estimated equal number of tickets sold at the door the day of the show. The conference falls somewhere between the large expos like San Diego Comic-Con, New York Comic Con, and WonderCon, and the small, largely local events like Philadelphia’s Locust Moon Comics Fest. Bruce stated that he wanted to produce a comic book convention in the spirit of “the original Phil Seuling cons from the ’70s.” As such, the focus was on comic books rather than the broader spectrum of sci-fi and horror television and movies that occupy much of the programming at the larger conventions. The impact of TV and movies was not entirely absent, however. A crowded panel session featured the stars of the AMC TV reality series, “Comic Book Men,” and Brian O’Halloran from the 1994 movie Clerks. 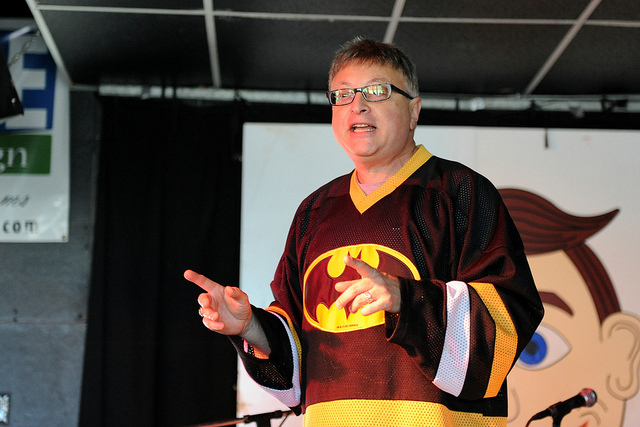 The expo’s keynote speaker, Michael Uslan, is best known as the executive producer of the Batman films. Yet comic books were central to the conversation throughout the day. The AMC TV show is, after all, a program about a comic book store, and Uslan’s journey to Hollywood started with his love of comic books. In his talk, Uslan told the tale of how a kid with “an incredible passion for superheroes, especially Batman,” became the first person to teach a college course on comic books, and later went on to write Batman stories for DC Comics, acquire the movie rights to Batman, and struggle for 10 years until he was able to bring his vision of a “dark and serious Batman” to the movie screen. It’s an inspiring tale of dedication, perseverance and a love for comic books — a story Uslan related in his autobiography (The Boy Who Loved Batman) and previously discussed with Knowledge@Wharton (see: “Movie Producer Michael Uslan on Superheroes, Comic Books and Why Hollywood Doesn’t Get It” and “The Boy Who Loved Batman: Michael Uslan’s Journey from New Jersey to Hollywood“). Yet there was added resonance in hearing him tell the tale in Asbury Park, where the young Uslan would pick up comic books at the local drug store and later, as a teen, drive his car around “the circuit,” the loop around Ocean and Kingsley avenues — directly outside the Wonder Bar where he was giving his talk. Michael Uslan, executive producer of the Batman films. Photo by Kendall Whitehouse. Vendors on the show floor included multiple generations of comic book artists and writers. In addition to the 92-year-old Jaffee, the golden age of comic books was represented by 88-year-old Allen Bellman, who drew Captain America and the Human Torch for Timely Comics (the predecessor of Marvel Comics) in the 1940s. At the other end of the spectrum, many of the vendor tables were occupied by young self-published comic book creators and small, independent publishers. Unlike the comic cons in San Diego and New York, there were no large booths from the major comic book companies like Marvel, DC, Image or IDW. Co-founder Bruce seemed fine with this. “I like the oddball comics,” he said, adding that he believes the future of comics lies with indie productions — “guys with a Xerox” who publish and market their own creative content. Asbury Park Comic Con 2013.